Sharnford Horticultural Ltd is based near Frolesworth, Lutterworth and South Leicestershire. We have a wonderful spacious premises and showroom, with plenty of free parking. Our staff members are courteous and friendly and we also have engineers available to visit customer premises. We are your local garden machinery experts. In our many years of business, our customer base has grown substantially, yet our customer service remains the core priority. We stock a wide range of lawnmowers, garden tractors, chainsaws, brushcutters and many other products and we can provide expert advice on the correct machine to meet your needs. We also provide servicing, repairs and spare parts for all leading brands of garden machinery. 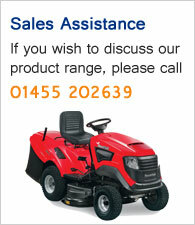 If you have a garden machinery problem, we can provide a solution. We are a factory approved sales centre for Mountfield, Stiga, Husqvarna, Hayter, Iseki and Grillo. Visit our showroom today and view our range of Gardena watering products. We also stock Heat Logs, Tripod Ladders, the Portek Sawhorse, chainsaw oils and machinery engine oils.